The release of information from the Census of Population 2016 provides an interesting opportunity to look back 175 years to the Census of 1841 to see how population in the Western Region has changed. The 1841 census is considered to be the first modern census in the Great Britain and Ireland (the UK as it was then). Each householder was required to complete a census schedule which contained the household address and the names, ages, sexes, occupations and places of birth of each individual living at the address. The process is described here. That Census, occurring before the devastation of the famine, provides information about a different Western Region. Of course we know that in 1841 pre famine Ireland was a very different place, yet sometimes it is hard to believe how altered things are. Leitrim then had a population of 155,297 (it is now 32,044). Roscommon had more than a quarter of a million people, it now has 64,544 residents. For those of us who know these counties, it is strange to think about how much more densely they were populated and how little obvious evidence of that population remains. Population density has of course reduced significantly throughout the Western Region (Table 1). 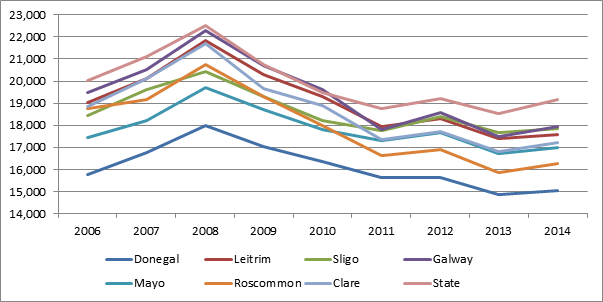 It had been particularly high in Roscommon (99.52 persons per square kilometre), Sligo (98.44) and Leitrim (97.74) where some of the largest population losses occurred over the next decade. As is evident from the changes in population density, all of the counties in the Western Region have suffered severe population decline since 1841 as is shown dramatically in the chart below. Of course the most rapid decline in population coincided with the famine (shown by the change between the 1841 and 1851 census), with Western Region counties losing between 32% (Roscommon) and 14% (Donegal) of their population in that decade. Bald population data can only indicate the horror of that time. After 1851, as we know, the population continued to decline, for the most part at a gradually decreasing rate, until the 1971 Census when the population of Clare and Galway both showed increases. 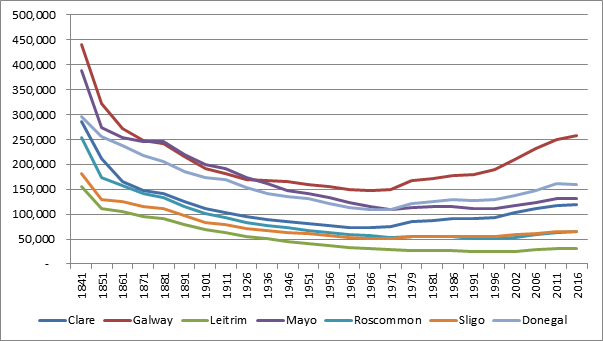 Other Western Region counties followed over the next decades (with some fluctuations) and Leitrim experienced its first population increase since 1841 in 2006, 165 years later. None of the Western Region counties have yet returned to their 1841 population levels (Table 2) through there is significant variation in the percentage of the 1841 population resident in each county today. The State, which had a population of more than 6.5m in 1841, now has 73% of its 1841 population. There are predictions of more rapid population growth see here and here and here , bringing the population back to pre-famine levels before the bicentennial of the 1841 census. This is largely due to more significant population recovery in other parts of Ireland, in particular on the east coast around the capital. Despite declines in the nineteenth century (except in Dublin), five counties (Table 3) in the State now have higher populations than they did in 1841. The population has moved eastward (and out of the State), but if rising population is a good indicator of a successful economy and society, it is to be hoped that the Western Region can also recover much of its pre-famine population by 2041. Perhaps the forthcoming National Planning Framework will be instrumental in achieving this. However, given shifting population patterns (see here) it is likely that the 2041 population will be living in very different parts of the Region than in 1841. The population of Dublin County grew by 9% in that decade, the only county in the State which showed growth. Detailed population figures from the Census of Population were published last week in Profile 2 – Population Distribution and Movements which looked at population density, rural and urban populations and the population in towns. 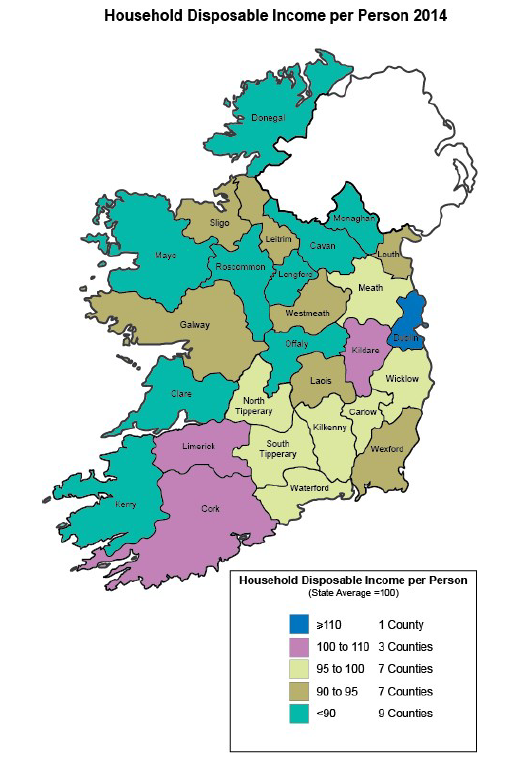 In Ireland as a whole just over a third (37%) of the population live in rural areas (that is outside towns of 1,500). In contrast, in the Western Region shows the opposite pattern and 65% live in rural areas (Figure 1). This is a marginal decline on 2011 (when it was 66%). 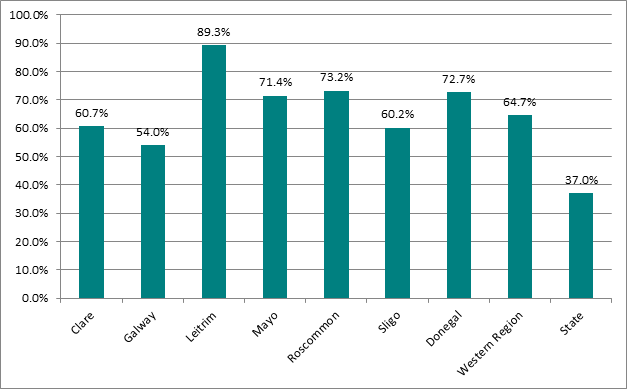 The rural population of the seven counties varies from almost 90% in Leitrim (where there is only one ‘urban centre- over 1,500) to 54% in Galway which of course includes the largest settlement. 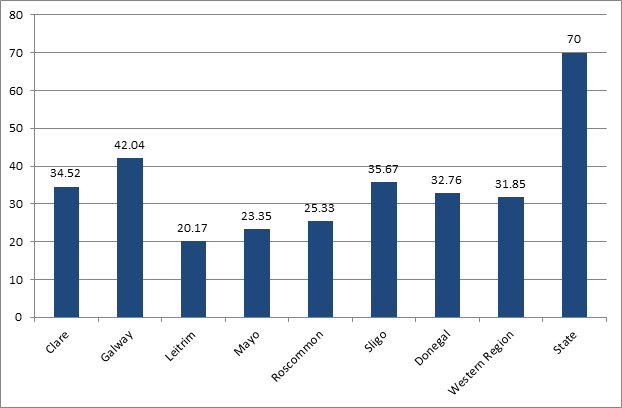 After Leitrim, Roscommon, Donegal and Mayo are the most rural of the Western Region counties. 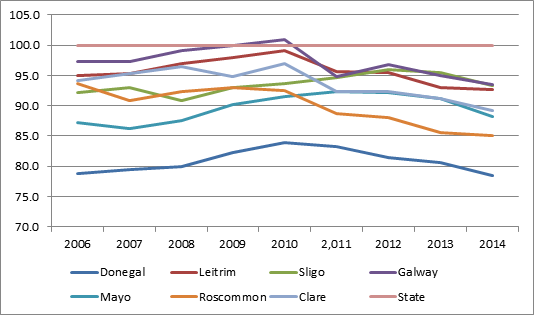 Sligo and Clare, along with Galway are slightly less rural. It should be noted that Galway county (i.e. excluding the city) is one of the most rural with almost 78% of the population living in rural areas. Figure 1: Percentage of Population living in rural areas in the Western Region and State. Each county, and the Western Region itself (64.7%), has a significantly higher proportion of people living in rural areas than for the State as a whole (37%). Density is another key indicator of rurality and it certainly is important in considering the provision of services. In Ireland as a whole the population density is 70 people per square kilometre and in the more rural Western Region it is almost 32 people per km2 . Again there is considerable variation by county and as can be seen in Figure 2 below, this largely mirrors the rurality of each of the seven counties. Galway has the highest population density (42 people per square km) and Leitrim has the lowest with just over 20 people per square kilometre. The population of towns across is also included in this Profile and looking at towns across the region the weak urban structure of the region is evident. Galway is the significant city, with a population of 79,934 in 2016. Only five towns have a population of more than 10,000 people (Table 1), and all of these had population declines between 2011 and 2016 though, with the exception of Ballina these were small. Ennis, the largest settlement after Galway is less than a third of its size (25,276 people), and it had a slight population decline (-0.3%) while Letterkenny (19,274) and Sligo (19,199) also had population decreases (1.6% and 1.3%). 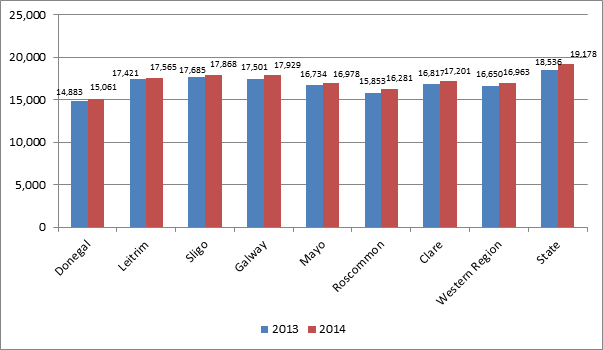 The population of Castlebar (12,068) fell by 2% but that in Ballina (10,171) fell by a more significant 8.3%. *Boundaries used for these Census towns have been changed since 2011 so the populations between 2011 and 2016 are not directly comparable. See this post for more discussion. 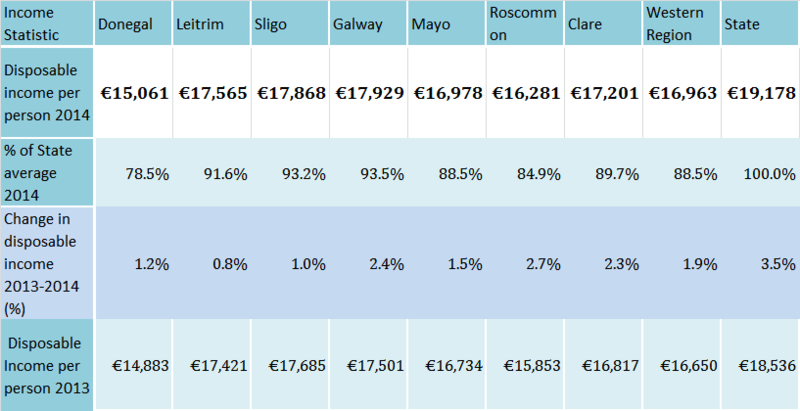 There are a further seven towns with a population of more than 5,000 (Table 2) giving a total of 13 towns including Galway in that size category (5,000-9,999) in the Western Region. All of the towns in this category grew with the exception of Buncrana (-0.8%) and Ballinasloe which had no change. The largest growth was in Loughrea (9.8%) which, along with Tuam, serves as a residential location for people working in Galway. There are a further 27 towns in the Western Region with a population of more than 1,500 and which are therefore categorised as urban. Athenry (12.5%), Gort (13.2%), Tubbercurry (13.7%) and Collooney (17.6%) showed the strongest growth, while Clifden showed a very significant population decline (-22.3%) partially associated with the closure of a Direct Provision Accommodation Centre in 2012. While these urban populations are significant in the context of the region, it should be remembered that more than half a million people (535,953) are living in rural areas (in small settlements and open countryside) in the Region. The CSO has provides population details of a further 201 settlements in the Region, the smallest of these is Malin (population 92) and 103,936 people live in these. A total of 440,888 (53%) therefore live in more open countryside (and in even smaller settlements). It is important to remember that the Western Region is a very rural region, and while higher level services (for example in health and education) should be provided in the larger urban settlements, the needs of those living in more rural, dispersed populations and the best means of providing services and access to services and employment in these areas must be considered. For some more detail on town populations in each Western Region county see the WDC County Profiles. In our WDC Submission to the consultation, we drew on previous WDC analysis including the WDC Policy Briefings ‘Why care about regions? A new approach to regional policy’, ‘Education, Enterprise & Employment – How Can Better Integration Of The 3Es Drive Growth In The Western Region?’ and ‘e-Working in the Western Region: A Review of the Evidence’ to answer this question. https://www.wdc.ie/wp-content/uploads/Growing-Regions-diagram.jpg 620 1175 WDC https://www.wdc.ie/wp-content/uploads/wdc-567.png WDC2017-05-02 10:09:332017-05-02 10:33:38What are the levers for effective regional development? Two weeks ago (6th February 2017) Minister Heather Humphreys hosted an All Island Dialogue on the implications of Brexit on Culture, Heritage, Regional SMEs & the Impact on Border & other Rural Communities in Cavan. This was one of the fourteen All-Island sectoral dialogues which have taken place across the country over the recent weeks. Over 100 stakeholders attended the event and there was engaged and active discussion of the issue throughout the day. To begin with the Minister outlined the Government’s ongoing response to Brexit. Then a panel of experts covering the broad range of sectors under the remit of the Department of Arts, Heritage, Regional, Rural and Gaeltacht Affairs each gave a short overview of the implications of Brexit for their sector. Roundtable discussions were then held to consider the immediate impact of Brexit, longer term impacts and how they might be mitigated. The focus was on arts, heritage, small businesses and rural communities. The discussions fed back into a broader panel discussion. A number of common themes emerged from the discussion (as well as detailed sector specific issues which are not covered in this post). A summary of the more general points raised by stakeholders, applicable to all sectors considered on the day, is provided below. Uncertainty over the form and impact of Brexit was key to all of the discussion. This was regarded as a particular problem as we are just emerging from recession. Uncertainty increases risks for businesses, communities, cultural organisations and people as they make decisions. Plans are therefore being delayed until a clearer picture emerges. This slowdown in individual and business decision making is affecting economic and social activities on both sides of the border, even before the full consequences of Brexit are known. There is very significant variation in the levels of knowledge of the possible implications of Brexit among businesses, communities and people. Some are well informed about possible difficulties or opportunities, others have very poor understanding and will therefore face more difficulty in making plans and developing responses to Brexit. Currency fluctuations and the loss of value of sterling have had the most immediate impact which has led to other direct impacts on tourism and retail businesses. Maintenance of the Common Travel Area and free movement of people was important to all involved in the discussion. Organisations staff and experts in various sectors move across borders regularly and any restrictions would negatively affect the functioning of these organisations and businesses. Ensuring the continued implementation of the Good Friday Agreement with associated institutions and commitments was regarded as essential. In future, changes to the way cross border services are provided in areas such as health and education will affect people living in border communities. Currently the UK and Ireland are in a common regulatory regime but this will change. Across all sectors there were concerns about the implications of divergence in regulation and implementation of different regulatory approaches. This is an issue in a variety of areas including, for example, procurement and data protection. The form of future taxation agreements, VAT rules and rates could be very significant and have important implications for businesses and arts and cultural enterprises. There will be a significant change to the funding landscape in the border region and beyond. It is unclear what will happen with the EU Peace programme, Interreg and other funding. It was agreed that the border counties will be most affected by Brexit, and of these counties some will be more severely affected (Donegal was mentioned as the example of this). There are over 300 border crossings and it is not clear whether they will all remain open in the future. There has been a significant increase in cross border activity since the Good Friday Agreement and there is concern that this will be diminished. This has business implications but also intangible effects on the mind-set of those living close to the border. A better understanding of the current trade and activities that take place across borders (between ROI and NI and between ROI and GB) is needed. This includes trade of goods and services, but we also have weak understanding of the reasons people are travelling across the border for work, trade or social reasons. Understanding of the cross border infrastructures which have been developing in recent decades is important. The implications of change for roads, energy infrastructure and broadband need to be considered. Changes in the way these are planned and managed will affect both Ireland as a whole and border communities in particular. There should be a focus on the development of new markets outside the UK and support both businesses and cultural organisations in doing this. There was a view that many of the benefits of Brexit will be felt in larger urban centres and that border and rural regions will be most negatively affected because of their proximity to the border, the nature of their enterprises and their smaller population base. There is concern that here could be further rural de-population if the opportunities that Brexit may bring are confined to the Dublin area. This needs to be addressed in a coherent manner. There was a suggestion that the concentration on Brexit will take the focus off other important issues already affecting the Border region, such as access to services, infrastructure and access to employment. Finally, among many of the participants, in all areas, there was a positive, ‘can do’ attitude. It was felt that we have had problems and difficulties before and have dealt with them. There was concern that there might be an overly negative portrayal of the implications of Brexit, and that this in turn was affecting the confidence of enterprise, communities and people and in turn affecting their decision making. Clear information needs to be made available about the possible implications for Brexit for communities, cultural organisations and businesses, addressing their specific issues. It is important that there is more analysis and understanding of the current situation in regard to cross border trade, cross border service provision, and the on-going community engagement across borders. This information needs to be used as a basis for considering Brexit implications and appropriate response. With more detailed information we can have better policy responses. Analysis should not just address issues of business or trade but also the hard to measure issues of social integration, identity and sense of place along the border. It will be important that the implications of differing regulatory standards are well understood and that these are considered both in Brexit negotiations and in developing responses to this regulatory issue in future. We should use expertise from other member states which have borders with non EU countries to get a better understanding of the potential issues and to understand their models and means of ensuring that borders and relationships between EU and Non EU countries are smooth and seamless as possible. The potential for substitution of imports from the UK needs to be explored as it may provide opportunities across a range of sectors. The government needs to continue to consult stakeholders as the impacts of Brexit become clearer so that responses and actions can be developed. We should examine problems individually and develop responses to each. There cannot be one single policy response, each issue will need to be addressed. Brexit is complex and responses should be tailored to the individual issue. Future government policy, including the National Planning Framework, needs to take into account the potential implications of Brexit and the changing nature of the border and ensure that there is a plan for a positive, sustainable future for the border region. Special supports for the border region should be considered, in terms of structural funds as well as enterprise and community support and funding. A specific fund for EU regions with sharing a border with non EU countries should be developed to mitigate the difficulties faced by these regions. The focus in this dialogue on rural communities and on the Border region was significant, as these are likely to be the most immediately and directly affected by Brexit. Uncertainty was a key theme of the discussion, and it is to be hoped that once Article 50 has been declared by the UK government and negotiations begin, that the situation may become clearer. You can sign up for on-going updates on Brexit here. The Action Plan for Rural Development –Realising our Rural Potential –developed by the Department of Arts, Heritage, Regional, Rural and Gaeltacht Affairs (DAHRRGA) was launched yesterday (23.01.17) in Ballymahon, Co. Longford as was mentioned in our last post. The Action Plan contains 274 actions which are to be completed over the next three years and uses the Action Plan for Jobs as a model with responsibility for the delivery of each action is assigned to a government department or other body. Each action has a clear timeline. There is an emphasis on the positive assets of rural Ireland and on ‘changing the narrative towards the contribution made to our economy and society by rural areas, rather than a focus on rural decline’. It is recognised that rural Ireland is not a homogenous place and that different areas face different challenges. There is no clear definition of rural Ireland but it seems to use that defined in the CEDRA (Commission for Economic Development of Rural Areas ) “all areas located beyond the administrative boundaries of the five largest cities”. The Action Plan builds on the CEDRA report and the Charter for Rural Ireland and contains a number of actions which build on these. For example, a review of the implementation of the CEDRA report is one action, while the REDZ are also part of the Action Plan. 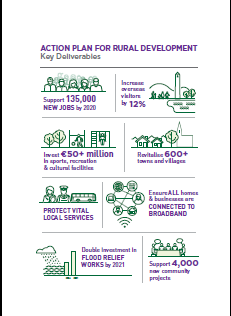 The Action Plan outlines the population and other changes which have been taking place in rural Ireland and briefly examines the challenges and opportunities faced by rural areas. One of the key challenges noted is BREXIT and the Western Development Commission is committed to an action (along with DAHRRGA) to examine the impact of BREXIT on rural areas and on border areas in particular. Supporting the creation of 135,000 new jobs in rural Ireland by 2020 by assisting indigenous businesses, investing €50m for collaborative approaches to job creation in the regions, and increasing Foreign Direct Investment in regional areas by up to 40%. Implementing a range of initiatives to rejuvenate over 600 rural and regional towns. Introducing a new pilot scheme to encourage residential occupancy in town and village centres. Assisting over 4,000 projects in rural communities to boost economic development, tackle social exclusion and provide services to people living in remote areas. Increasing the number of visitors to rural Ireland by 12% in the next three years through targeted tourism initiatives, including increased promotion of Activity Tourism. Accelerating the preparation for the rollout of high-speed broadband and ensuring that all homes and businesses in rural Ireland are connected to broadband as early as possible. Improving job opportunities for young people in rural areas by increasing the number of apprenticeships and traineeships available locally. Developing an Atlantic Economic Corridor to drive jobs and investment along the Western seaboard and contribute to more balanced regional development. Investing over €50 million in sports, recreation and cultural facilities throughout the country, including in rural areas. Protecting vital services in rural Ireland by improving rural transport provision, enhancing rural GP services and protecting rural schools. Introducing a range of measures to boost job creation in the Gaeltacht, including the creation of 1,500 new jobs in Údarás na Gaeltachta client companies by 2020 and the development of Innovation Hubs in the Donegal, Mayo, Galway and Kerry Gaeltacht regions to support entrepreneurship. Combating rural isolation by improving connectivity and enhancing supports for older people, including significant investment in the Senior Alert scheme. Building safer communities by providing a more visible, effective and responsive police service in rural areas through the recruitment of 3,200 new Garda members over the next four years to reach a strength of 15,000 members, and by introducing a new community CCTV Grant Aid Scheme. Improving societal cohesion and wellbeing in rural communities by supporting cultural and artistic provision and participation. One of the important outcomes of the Action Plan should be a more integrated approach to rural issues across government departments and agencies. The implementation of the Action Plan will be overseen by a Monitoring Committee which will include representatives of relevant government departments and key rural stakeholder interests. The Committee will be supported by DAHRRGA. Reports will be submitted every six months to a cabinet committee on Regional and Rural Affairs which is chaired by the Taoiseach and the progress reports on the delivery of the actions will be published. The Minister for Arts, Heritage, Regional, Rural and Gaeltacht Affairs, Heather Humphries, TD has appointed Pat Spillane as an Ambassador for the Action Plan for Rural Development who will assist the Monitoring Committee in identifying the impacts of the Plan on Rural Ireland and encourage businesses, communities, sporting organisations and others to engage with the Plan. Mr Spillane previously acted as Chair of the Commission for Economic Development of Rural Areas (CEDRA). He will also be a member of the Monitoring Committee which will oversee the implementation on the Action Plan. While the majority of the actions are already part of government policy including them in the Action Plan means that their progress will be regularly monitored by Monitoring Committee which should ensure continued focus. There is a short video also available. A new Action Plan for Rural Development is to be launched on Monday (23rd January) by An Taoiseach Enda Kenny in the Longford town of Ballymahon. The Action Plan has been prepared by the Department of Arts, Heritage, Regional, Rural and Gaeltacht Affairs. It will include more than 250 actions and is to act as an overarching structure for the implementation of government initiatives for rural Ireland. It is expected to draw on the commitments in the Programme for a Partnership Government and recommendations in the report Commission for Economic Development of Rural Areas (CEDRA) and the Charter for Rural Ireland. It will use a similar framework to the Action Plan for Jobs and will contain time bound actions with each action the responsibility of a department or agency. The new Plan will form part of a suite of Rural Policies which include LEADER, the Town and Village Renewal Scheme, REDZ (Rural Economic Development Zones) and Clár . It is to be hoped that there will be a good link with the forthcoming National Planning Framework (see here and here) and the Regional Spatial and Economic Strategies which will have significant influence on the development of Rural Areas in Ireland. 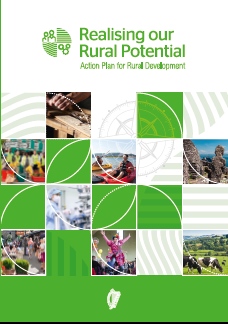 We’ll provide more detail on what is contained in the Action Plan for Rural Development in our next post following its launch.